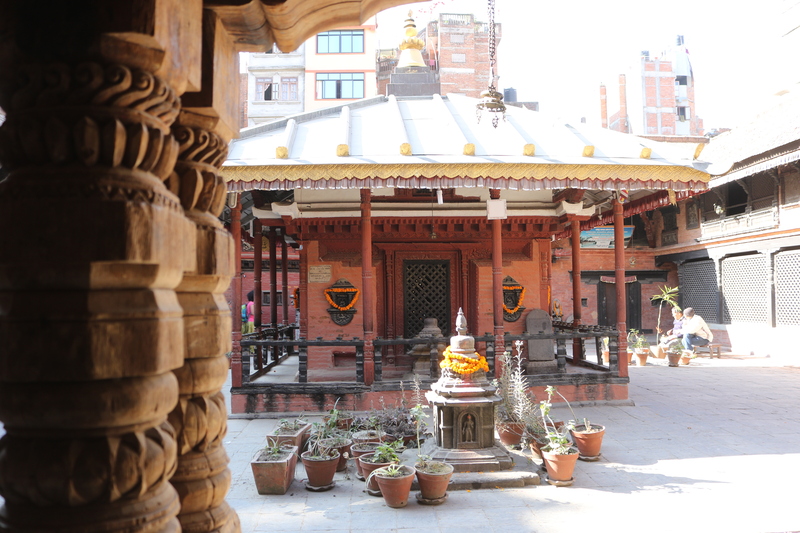 The identity of Newar civilisation is preserved in Nepal’s many courtyards, one of which is Itumbahal in old Kathmandu. Though many families have now moved out of this enclosure, and sold their land for housing projects, the culture of the place lives on. 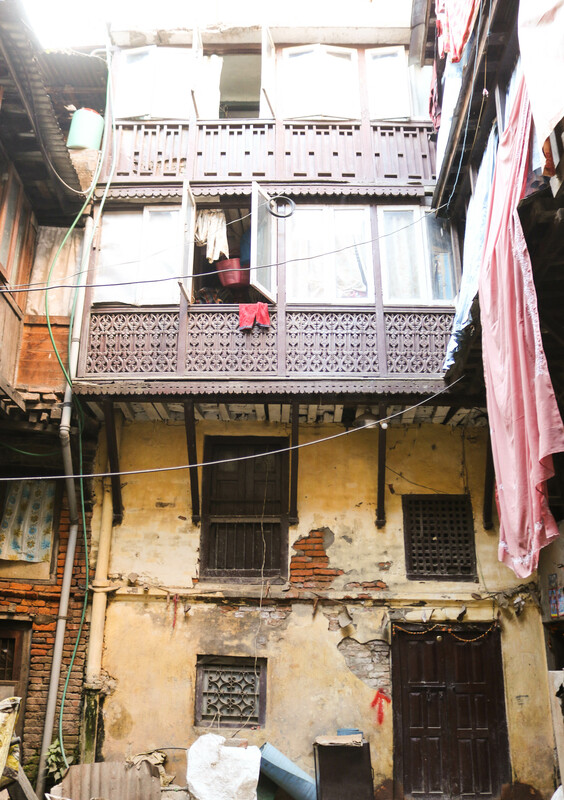 Hidden in the narrow chaotic lanes of old Kathmandu, Itumbahal (bahal translates to a Buddhist monastery courtyard) is in contrast to its surrounding streets. Taking a few steps inside the main entrance, we stand facing one of the biggest courtyards of Kathmandu. There are doodles on the walls around, and a huge wake-up alarm bell for the entire neighbourhood. The place is a living example how the community in the town has changed over the past two decades. The place has changed in the last 20 years or even less- the armed revolution of the Maoist created a ruler community in the valley. The demand for residential houses shot up and a lot of farmlands got converted into bungalows and apartment complexes. This is the reason why it is now difficult to find local farmers drying their grains in Itumbahal. However, there are certain things that still remain unchanged. As we look around, we spot old traditional shops selling herbs and spices. These little stores are the last remaining samples of the age-old traditions practiced by the Nepali baniyas (a community of merchants, dealers in grains or spices, bankers, money-lenders, etc.). As we walk further, one of the first things that attracts our attention is the Manjushree temple. Manjushree is one of the most important deities in Buddhist religion. The Kathmandu valley was once a lake and according to Buddhist legends, it was Manjushree who drained the water out, creating the valley, and enabling early settlements. “When I was a kid, I had a terrible pain in my ear that did not go despite antibiotics. It was then when a priest made me go around the Manjushree temple three times, came close to my ear and said some mantras (chants). I still can’t explain how I felt, but the pain vanished,” recalls Robin D’costa, who spent his childhood in the courtyard. The place is full of stupas and temples, all of which have a different belief associated with them. White tara temple (also called the docking tara) is another symbol of longevity, compassion and healing. The locals believe that the goddess flew from Tibet to Itumbahal. Just adjacent to the temple, on the left, is a red brick wall structure that houses a well. The enclosure is believed to host the Nayagas (snake deities) and thus the water inside the well is believed to have healing powers. The water is only fetched once a year to bathe another Buddhist deity – Karunamaya, and is also offered to other main deities of the courtyard every morning by the priest. Interestingly, apart from temples, for a courtyard to qualify as a monastery, there needs to be an astrologer who resides in the courtyard. Using the passer way behind the temple, we reach another square in the courtyard that is filled with earthquake wreckage supporting old buildings. The area houses a third generation local astrologer. According to the board hanging outside his house, he works for fixed hours to read birth charts from 8-11 am everyday. Itumbahal is a labyrinth of courtyards and walking through them gives a sense of old urban planning. 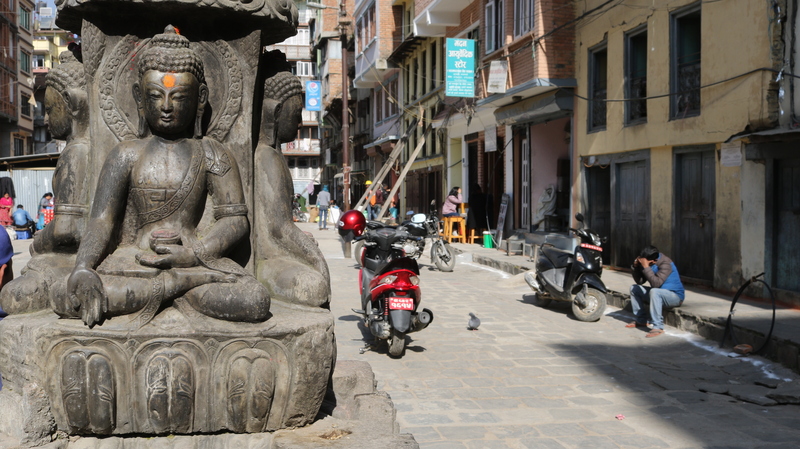 But the bahal is a place beyond infrastructure – it is a living history of how the Nepali society has changed, and how ancient folklore and supernatural beliefs continue to live in modern times. Rajamati, the legendary Nepalese beauty also lived here some 200 years ago. Hidden in a tiny square, her light yellow coloured house was renovated after the massive earthquake of 1934, and lost its old architecture. Rajamati’s song is a traditional Newari ballad. Despite the song’s popularity, even today few people are aware that Rajamati was an actual person and fewer still probably know that her house still stands.